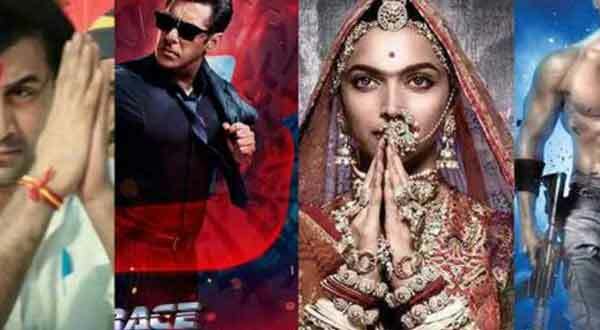 Here’s all about first 3 days Box Office report of a Bollywood film releases in 2018. Check Bollywood‘s Highest First Weekend Grosser 2018. The year started with a clash between Kaalakaandi, Mukkabaaz and 1921 while megastar Salman Khan’s Tiger Zinda Hai was already ruling Box Office released on Christmas 2017. Here’s regularly updated Bollywood’s Top 10 Highest First Weekend Grosser 2018 List. 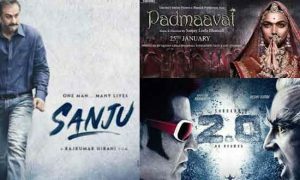 Ranbir Kapoor’s Sanju is on top of all time with 120 Crore, then Sallu’s TZH, Shah Rukh Khan’s Happy New Year on top 3. Salman Khan’s Sultan (2016) weekend grosser is Rs 105.34 Cr, Bajrangi Bhaijaan (2015) weekend Rs 102.6 Cr, Prem Ratan Dhan Payo (2014) Weekend Rs 101.47 Cr, Chennai Express (2013) Weekend Rs 100.42 Cr, PK (2014) weekend Rs 95.21 Cr, Golmaal Again (2017) 1st Weekend Rs 87.60 Cr, Kick (2014) Rs 83.83 Cr. Here we have written an article about first three days collection while Padmaavat released on Thursday and including limited previews, Padmaavat had five days of the first weekend collected Rs 114 Crore in the first weekend but 77 in first three days. So Sanju and Race 3 are the weekend winner because Ranbir’s Sanju scored 114 Cr in 3 days while Salman Khan’s film scored 106.47 Cr in first 3 days. After Padmaavat, Gold, SMJ, and Thugs had long weekends and collected 71.30 Cr, 56.91, 119 Crore in the first weekend respectively. Baaghi 2, Zero, Veere Di Wedding, Gold, Raid, Padman, Satyamev Jayate, Dhadak, Stree, Raazi, Sonu Ke Titu Ki Sweety, October, Parmanu, 102 Not Out, Hichki, Pari, and Hate Story 4 did well on the first weekend.